If your mind and heart are wired toward social justice, you may have come across Shane Claiborne and Jonathan Wilson-Hartgrove before. Shane Claiborne is known for his activism, and the sometimes shocking demonstrations that have deemed him a radical for God and an advocate for the poor. He would call himself an “ordinary” radical. You can read much of his story in his first book, Irresistible Revolution. Jonathan Wilson-Hartgrove is a great writer and thinker in the same stream. Some of Jonathan’s books include God’s Economy and New Monasticism. The book is divided into three parts: the first is about the Lord’s Prayer; the second is about Jesus’ prayer for the church in John 17; and the third reflects on Paul’s prayer for the Ephesians (1:15-23). Scattered throughout the pages of this little gem are prayers from church fathers, leaders and saints of old. Often we think we have to be creative and spontaneous in our prayers, but there are rich words we can borrow from our brothers and sisters who lived in the past that will help us connect with God’s heart and mission for today. The next time you are praying and expecting a response, see if God is pointing a finger back at you to become the answer to your own prayer. Becoming The Answer To Our Prayers: Prayer For Ordinary Radicals is a risky book worth your attention. 1. Becoming the Answer to Our Prayers: Prayer For Ordinary Radicals, 10.2. Ibid., 11. 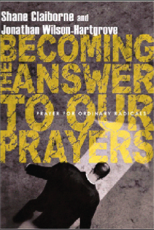 Becoming the Answer to Our Prayers: Prayer For Ordinary Radicals is available by contacting Wordcom Christian Resources at wordcom@paoc.org or (905) 542-7400, ext. 4248. Price is $15.99 Canadian (plus shipping and tax).